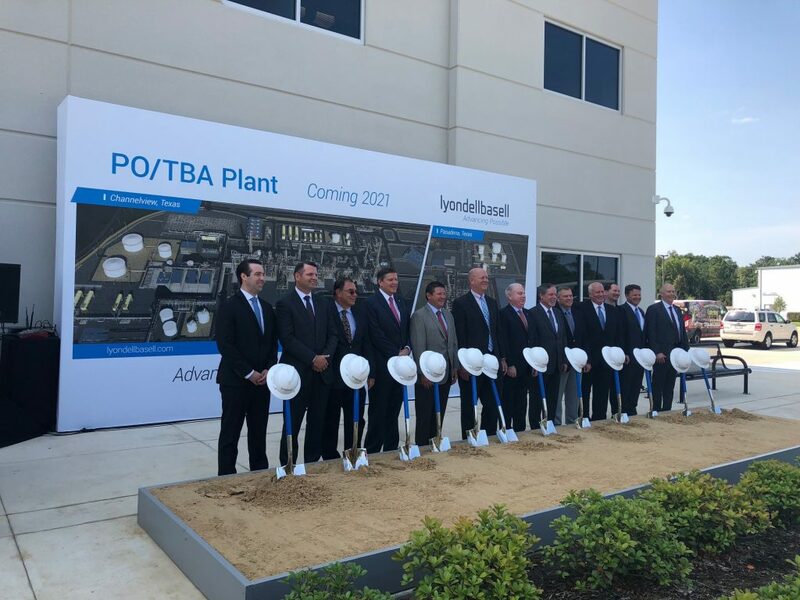 HOUSTON (ICIS)--Global chemicals producer LyondellBasell broke ground on Wednesday for its $2.4bn propylene oxide (PO)/tertiary butyl alcohol (TBA) project in Channelview, Texas. “Today’s groundbreaking is a historic moment for our company,” said CEO Bob Patel. The complex, when completed in 2021, will be one of the largest in the world, and is expected to create up to 2,500 jobs and approximately 160 permanent positions when operational. Production capacities will stand at 470,000 tonnes/year for PO (1bn lb/year) and 1m tonnes/year for TBA. PO is used in the manufacture of bedding, furniture, carpeting, coatings, building materials and adhesives, and the TBA will be converted to two ether-based octane enhancers, methyl tertiary butyl ether (MTBE) and ethyl tertiary butyl ether (ETBE). Two facilities will be constructed on existing manufacturing sites. The 140-acre PO/TBA plant will be built at the company’s Channelview complex, while an associated 34-acre (14-ha) ethers unit, converting TBA to ETBE or MTBE, will be built at its Bayport complex in Pasadena. The company chose to build the new plant at these existing locations along the Texas Gulf Coast because of their proximity to low-cost feedstocks and the infrastructure needed to ship products around the globe. The company said it would aim to sell the PO and its derivatives both domestically and internationally, while most of the oxyfuels produced will be exported to Latin America and global markets. MTBE was phased out of the US gasoline pool over a decade ago in favour of corn-based ethanol. However, international markets, such as Mexico, Latin America and China, remain a robust destination for the gasoline additive, and Patel said the company sees its high-octane fuels production as key to the growing market. “If you look at cars today you see more and more four-cylinder engines that have high compression engines that require much higher quality fuels,” Patel told ICIS.